You can never say that Opera Theatre of St. Louis is short on ambition. As the company launches it 43rd season it once again brings its proclivity of showcasing both emerging artists and major stars for a dazzling season highlighted by their 27th world premiere and presenting a vibrant reboot of Giuseppe Verdi’s La Traviata, set amidst the ostentatious revelry of the City of Lights in the 1930s. At the nexus of this scene is Violetta Valéry, a courtesan whose lively soiree celebrating her return to action after a prolonged battle with consumption evolves into something much bigger after she meets that a determined admirer, Alfredo Germont, who has been woefully smitten with her for quite some time. From here things get pretty sour as Alfredo, learning that Violetta has been selling possessions to help fund their estate, charges off to settle her affairs. Meanwhile, Violetta is cajoled into stepping out to a chic party. Delighted to return to her element, her night out is disrupted after the arrival of Giorgio, Alfredo’s father, who demands that she end her romance in order to save his family from shame and embarrassment. This intervention causes the couple’s relationship to disintegrate, thrusting Violetta back into her old life and once again on the arm of her ex, the boastful Baron Douphol. Returning to Paris, an angry Alfredo succumbs to his machismo and causes a scene, causing the Baron to challenge his rival to a duel. The ensuing stress, bravado and escalating tension are too much for the former courtesan who collapses from all the heartbreak and melodrama. As the final act unfolds, Verdi’s opera reaches a grandiose apex of pain and suffering as Violetta, ravaged by tuberculosis worsens. Near death and alone, her beloved visits her one final time. Knowing that this timeless classic needed a new coat of paint, OTSL recruited soprano, Patricia Racette to splash the season opener with a different perspective. Having starred as Violetta repeatedly in various forms and incarnations, the bold Racette does not disappoint in delivering an invigorated production of a classic work. One of the biggest names in opera, Racette’s presentation pairs bright colors and Camillas as visual centerpieces that contextually frame the taut fragility underpinning Violetta and Alfredo’s tumultuous relationship. The potency of this director’s interpretation also stems from her extensive knowledge of the libretto. As a result, La Traviata resonates emotionally by amplifying the feminism of Sydney Mancasola’s Violetta and pairing it with the adolescent charm and vulnerability of tenor Geoffrey Agpalo’s Alfredo. She also astutely plays on the audience’s heartstrings with tight pacing, a tactic that enables the spectacle of the romance to seep in gradually before unraveling completely in the third act. Since Racette has brought multiple versions of Violetta to the stage it should come as no surprise that she has taken great care in turning the role over to Sydney Mancasola, a promising and powerful soprano whose decimating turn in the lead role will undoubtedly propel her to greater heights. 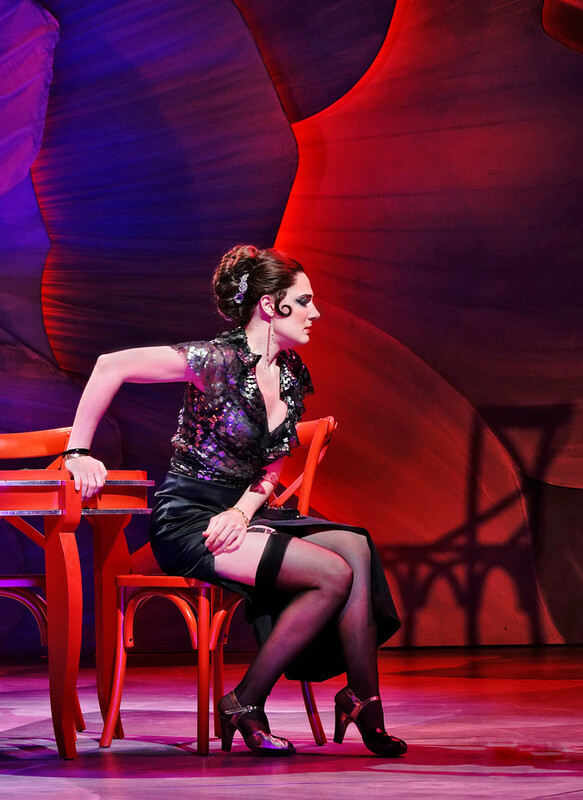 La Traviata also finds OTSL reuniting with crowd favorite Geoffrey Agpalo as Alfredo. Paired with the smoldering Mancasola, Agpalo brings the subtlety, playing Alfredo as the lovestruck lead who is enraptured but not overly sappy. While his performance is proud and majestic, his voice is relentlessly tragic is resonating emotionally with the audience. As far as opening salvos go you can’t do much better than this beloved tale about the fragility of one woman’s essence and her lover’s unyielding devotion. 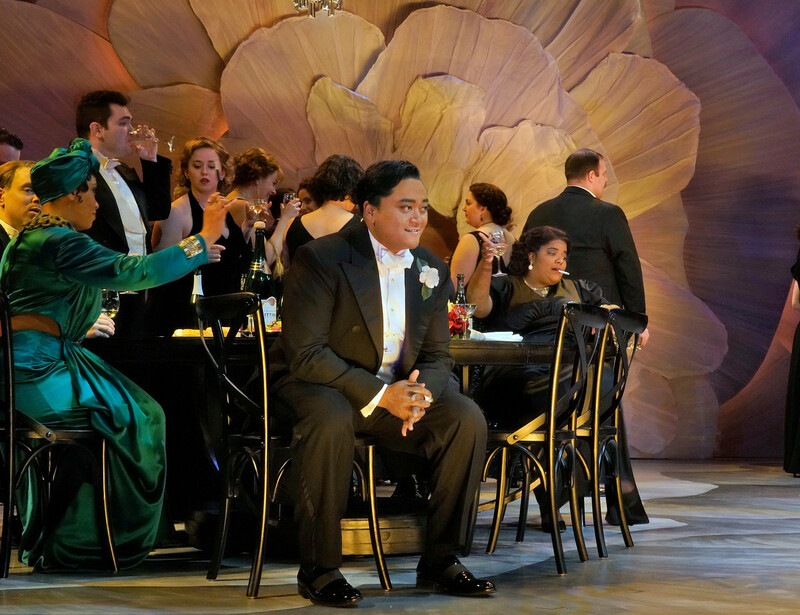 Newly minted, OTSL’s La Traviata delivers a bold and vivacious interpretation that melds torn hearts with terrific performances from its ensemble cast. Destroyed hearts have never been so captivating. La Traviata is sung in English with musical accompaniment from The St. Louis Symphony Orchestra. Performances are held at the Loretto-Hilton Center on the campus of Webster University. For more information visit http://www.opera-stl.org. Rob Levy is a native St. Louisan, freelance writer, and content creator who has been published in several print and online publications including St. Louis Magazine, ALIVE Magazine, St. Louis Business Journal, The Riverfront Times, Playback, Noisy Paper and The Beacon. He also writes articles for Onstl.com, needcoffee.com and anglotopia.net. Since 1995 he has hosted Juxtaposition on KDHX Radio. An avid fan about music, film and pop culture, he has written for needcoffee.com, anglotopia.net and several other online publications. He also is a member of the Weekend Justice podcast.